Where do you get the 3% figure from ? My guess is that about 40% would like the licence fee to be abolished. In all you calculations you make the assumption that the BBC will remain at its current size. 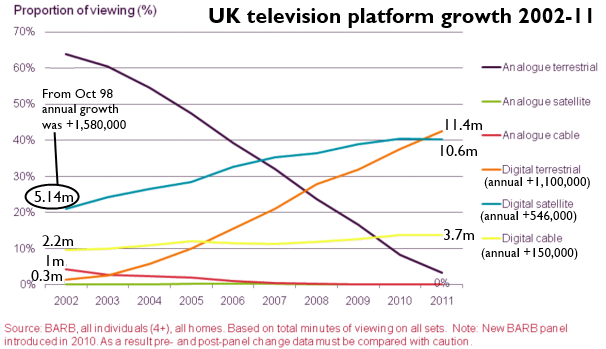 Many have the view that the BBC is too big and think it should reduce in size. Another assumption is that the BBC should raise the finance by subscription alone. I believe the BBC would best be financed by a combination of adverts and subscription with one or two free to air channels. trevorjharris: in this piece I'm considering a version of the status quo: 3% of homes claim to boot have a tv. Look I'm comparing my fact with your guess... Again. "As you will read from some of the data in this report, it is encouraging to see that despite the plethora of media choices available to the UK audience nowadays, 97 per cent of the UK population choose to spend an average of over 19 hours a week consuming BBC services across TV, Radio and Online. " And we've already been through the advertising problems, there simply isn't enough cash to cover all the outlets. True, Sky manages the neat trick of getting people to pay to watch advertising, but its not easy to see how this would work elsewhere. And its worth remembering that its ad revenue for 2013 was static at £440m, out of a total revenue stream of over £7 billion. And how would the BBC pay for those Free-to-air channels? Brian its going to happen in the next 10 years or so anyhow ,why defended a type of funding that`s had its day. If you are so sure people will want to continue with the BBC then subscription ,will prove it, because those who want it, will ,you guessed it subscribe. Richard E: Thanks for your comment. I'm a little disappointed: In the last two weeks I've game-planned 20 different options for the future of the BBC from 2017, and I have provided extended analysis and I hope a little insight. But, I have not expressed an opinion, so please don't characterise what I have written as such. I don't see how I'm supposed to be defending the status quo, honestly. 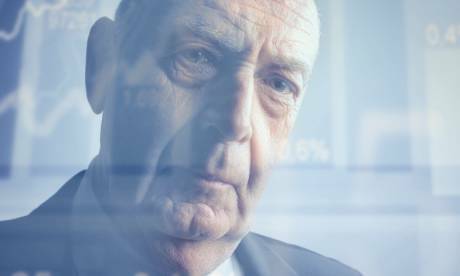 BBC, plc 2017: BBC announcement | BBC 2017 | ukfree.tv - 11 years of independent, free digital TV advice was clearly a game-play of the BBC plc by subscription. 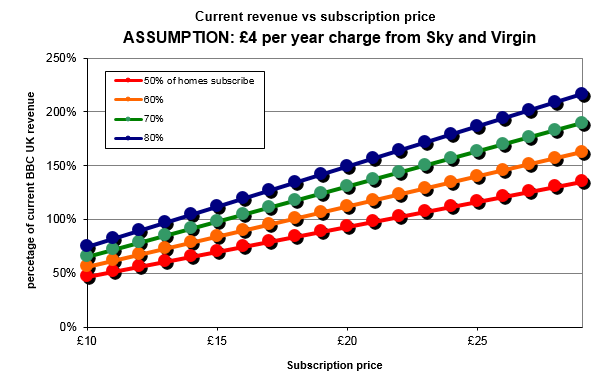 Anyway, as you DO have an opinion, then I'm all ears to understand, if you are correct that subscription is the way ahead, how you expect the 10.3 million homes (with at least 5.2 million PVRs) to switch to subscription. I'm just interested to know who is going to provide the hardware, the funding and do the installations. If you can also let me know who will run the DTT subscription system - given that several previous attempts have been total abortions - that would be great too. I look forward to your explaining "the obvious" to me. Thanks Brian , In the 90`s Channel 5 sent people to retune vcr`s ,in some area`s before scart sockets were invented . It was a big task ,but carried out . I am sure a method could be found & agreed to bring in subscription. The funding, for this may have to come from the Treasury or even the Lottery ,to get the technical side of this up & running ,but this is not impossible,I know you are the expert, but the way technology is evolving ,in ten years time we will wonder what all the fuss is about. I agree, I maybe totally wrong , but the future looks interesting at least .